Today we leave Winnipeg, Manitoba to head eastward to Western Ontario for the next portion of our road trip. The plan takes us to Fort Frances, Ontario where we will cross the border back into the United States at International Falls, Minnesota. From there we’ll head to Duluth to begin a journey around Lake Superior. Looking for interesting possibilities along our route I read about the Sandilands Forest Discovery Centre sponsored by the Manitoba Forestry Association. Their website indicates they will be open so we make the short detour only to find a bar across the road with a Closed sign. After crossing the border into Ontario we see that the Provincial visitor center seems to be permanently closed. In travel, as in life, you win some and lose some. On a more positive note, we find the Discovery Centre on the shores of Lake of the Woods just west of the town of Kenora a modern, well organized facility with exceptionally helpful and friendly staff. When I relate that I’ve been unable to contact our lodging for tonight by either phone or internet they volunteer to take care of the situation. Inquiring about a restaurant for lunch serving local fish they give detailed suggestions and directions. This time we’re on the winning side! The recommendation of The Boathouse is exactly what we wanted. The restaurant sits on the lake front with great views. An outdoor deck is inviting but a brisk wind makes us opt for an indoor window table. It didn’t take us long to make our menu selections – wild rice soup and beer battered walleye with parmesan fries. Both dishes proved to be excellent choices. At first the service seemed a bit lax but improved considerably. After lunch we spent some time exploring the town. Bob declared he could come back to Kenora for a stay instead of a just a lunch stop. We would certainly plan to be repeat customers at The Boathouse. We procede to Fort Frances for an overnight at La Place Rendez-Vous on the shores of Rainy Lake. (The lodge is basic and somewhat a disappointment but the setting is nice.) The evening’s entertainment beyond enjoying the lake front view is finely washing the Saskatchewan dust and Manitoba mud off the car. We’ve elected to spend an additional night in Winnipeg so that we can visit the Manitoba Museum – a decision we are very pleased with at the end of the day. A friendly receptionist gives us a brief description of the galleries and ticket options. The museum encompasses three major venues: museum galleries, science gallery and planetarium. Visitors may purchase tickets for one, two or three venues. Planning to spend the day, we select a two venue purchase. Little did we know; after more than five hours we are still exploring the museum galleries. Our aged legs and backs cry “uncle”. Flexible policies allow a refund for the unused venue portion. Probably the most popular exhibit is the replica of the two-masted ketch, Nonsuch. The original sailed into Hudson Bay in 1668 searching for furs. The Hudson Bay Company was founded two years later. To celebrate the company’s tricentennial the replica was built in England and sailed 14,000 kilometers of salt and fresh water before coming to the museum. Visitors may board the ship, wander around and below deck. A personal favorite was the Hudson Bay Company Gallery exhibiting items from the collection of 10,000 artifacts gifted to the museum by the HBC. “Manitoba’s National Treasure” includes natural history specimens, human history artifacts and items relating to the Company’s 300-year history and impact on Canadian commerce. From antique maps and items depicting First Nations’ traditional lifestyles to a replica of a HBC home office in London. I could have spent even more time in this gallery. The gift shop with a fine collection of Manitoba and Canadian arts, crafts and products called for a visit before we could leave the museum. I believe this was the best shopping of our trip. We concluded the afternoon with an early dinner at the downtown Keg Steakhouse before heading to our hotel to pack for tomorrow’s departure eastward. Second day in Winnipeg starts with breakfast at The Original Pancake House (Canadian style). A hard working staff with a positive, accommodating attitude serves very good coffee and breakfast exactly as we ordered. Somehow on the drive towards downtown I’m in the wrong lane, cross the wrong bridge and end up on the east side of the Red River. Unexpectedly we are right in front of Saint Boniface Cathedral. This was on my possible list for today so becomes our first stop. Much of the early 20th-century cathedral was destroyed by fire in 1968. A new, modern cathedral was erected behind the neoclassic facade and remaining walls creating an interesting juxtaposition of architectural styles. And, a popular location for photographers. We spend over an hour visiting the site, reading historic grave markers and in quiet reflection in the current sanctuary. Known as Winnipeg’s French Quarter, visitors could spend an entire day (or more) exploring the culture of the surrounding neighborhood. With limited time and great ambitions these two tourists cross the river to The Forks National Historic Site at the confluence of the Assiniboine and Red Rivers. This has been a gathering place for 6,000 years: aboriginal peoples, fur traders, buffalo hunters, settlers, and immigrants. Today it is Winnipeg’s #1 tourist attraction and encompasses museums, restaurants, lodging, shopping, and recreation. After our visit Bob sums up The Forks as “underwhelming.” We feel the history isn’t emphasized enough. Granted, in summer there are historical interpretation tours but nothing in mid-September. We find the shopping venues mostly imported tacky. Food options at The Forks seem uninspiring. The friendly manager at the Mint recommended Hermano’s in the Exchange District as her favorite Winnipeg restaurant. Sangria and tapas are the perfect late afternoon choice – sautéed shrimp, cheese board and watermelon cucumber salad. A visit to WAG – Winnipeg Art Gallery – caps our day as we take advantage of the Friday after 5pm out-of-towner ½ price. Their contemporary Inuit art collection specifically draws our interest. The museum gift shop is well stocked with creative, tasteful selections of art, jewelry, books, carvings and gifts. The best shopping we’ve seen so far. Similar to the morning drive we cross the wrong bridge and take the long way around to the hotel. Winnipeg is not laid our on a grid, the sinuous rivers and multiple bridges create traffic challenges. It often feels like you just can’t get there from where you are; but, in the end worth the effort. First morning in Winnipeg and we need a plan. Top three places we want to include are the Royal Canadian Mint, The Forks National Historic Site and the Manitoba Museum. Research shows that we need a reservation for a tour of the mint and that the museum is closed until Saturday morning for upkeep. Oops, we were planning on heading to Western Ontario on Saturday Morning. Upon calling the mint I am able to secure a 2:00pm tour reservation. What to do until then? We decide to check out Assiniboine Park, a large multi-feature park on the west side of town. After a drive through we stop for a walk in the English Garden and Leo Mol Sculpture Garden. An hour later we are sorry that it’s time to head to the mint, we could use more time in these two gardens and there is much more in the park to explore. Perhaps we will make it back during our stay – definitely an enticement. The rest of the afternoon is spent at the Royal Canadian Mint, one of two in Canada. (We visited the one in Ottawa almost twenty years ago.) The tour is informative with views down onto the production floor. A multitude of coinage and commemorative coinage lures visitors to the gift shop. Bob selects a 2015 mint set. The shop’s manager is our sales clerk and we appreciate her friendly manner since we leave with lots of local information and restaurant suggestions. Plus her husband is a huge Denver Bronco fan. Back at our hotel we find the area bustling with activity. There is an AC/DC concert at the nearby stadium tonight and the hotel is sold out. We decide to make life easy and have drinks and dinner at the hotel once the concertgoers have departed. A successful plan for Winnipeg day one. 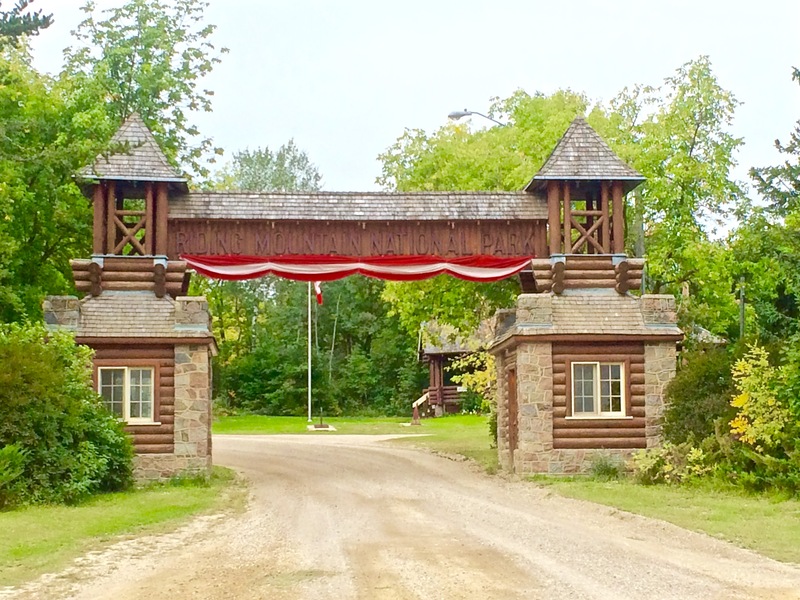 On the shores of Clear Lake in Riding Mountain National Park the town site of Wasagaming welcomes visitors. Here they find the park’s visitor center, marina, accommodations, campgrounds, dining, shopping and tourism services. The picturesque visitor center was build during the 1930s depression and serves as a good introduction to the area and recreational opportunities found in the park – a good first stop. Most permanent residents are park employees but during summer when the hundreds of cabins, cottages and campsites fill the population can swell to nearly 40,000. In summer the sandy beach attracts families and swimmers. For those wanting to get out on the water Clear Lake Marina offers a wide range of rentals: stand up paddleboards, pedal boats, kayaks, bow riders, large and small pontoons, and aluminum fishing boats. Or, join an afternoon, dinner or sunset cruise on the Martese. When we visited in mid-September we found the charming village, alive and open for business yet a sense of serenity. Wish we could have stayed for several days – especially after trying the caramel cinnamon rolls from the White House Bakery and Cafe. The Lakeshore Trail gave us the opportunity to burn a few of those calories with an early morning walk. I’d put Wasagaming on the return visit list. 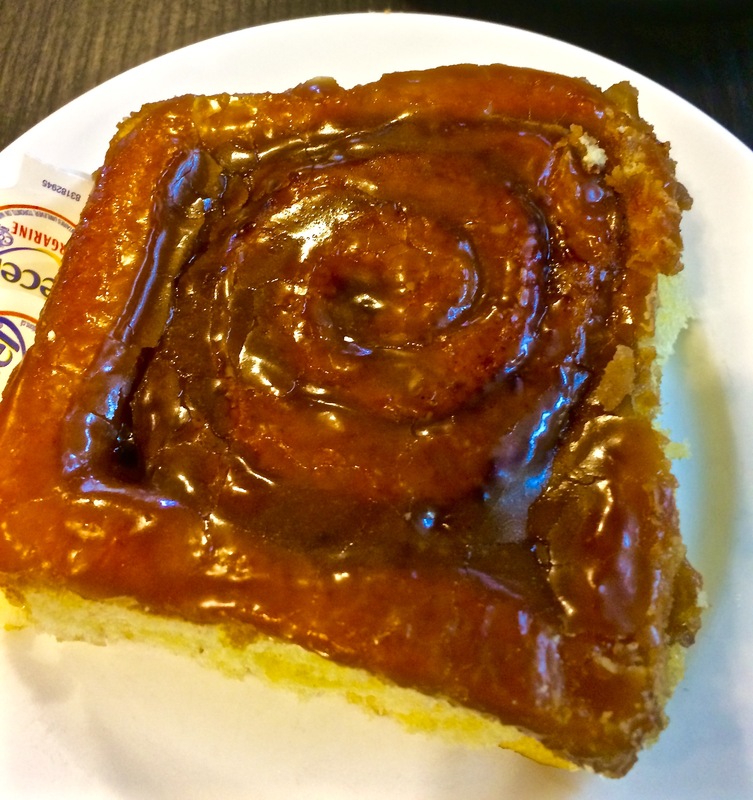 While reading a travel information booklet promoting Manitoba’s Parklands I found an article entitled, “Cinnamon Bun Trail.” That catches my attention and determines our breakfast destination – the White House Bakery and Restaurant in Wasagaming. In addition to fruit cups and Greek yogurt we each have to order one of the cinnamon rolls; the choices today were regular, cream cheese and maple. Two maples coming up – worthy of being featured along the Cinnamon Bun Trail. To exit Riding Mountain National Park we drive the gravel road to the east entrance, dropping down from the top of the escarpment to the flat Manitoba plains. We found the historic original log park entrance worthy of a photo stop even though the morning was cloudy. We head eastward towards The Narrows, crossing between sections of Lake Manitoba. While the lake looks large we know from the map that we’re seeing a minuscule portion. Watching the cloud cover it keeps looking like we’ll soon be out from under the cloudy skies, so far no luck. East of Poplarfield we pass another of the Historic Ukrainian churches, one of three we will see along our route today. Our intention was to make it to Winnipeg this afternoon. 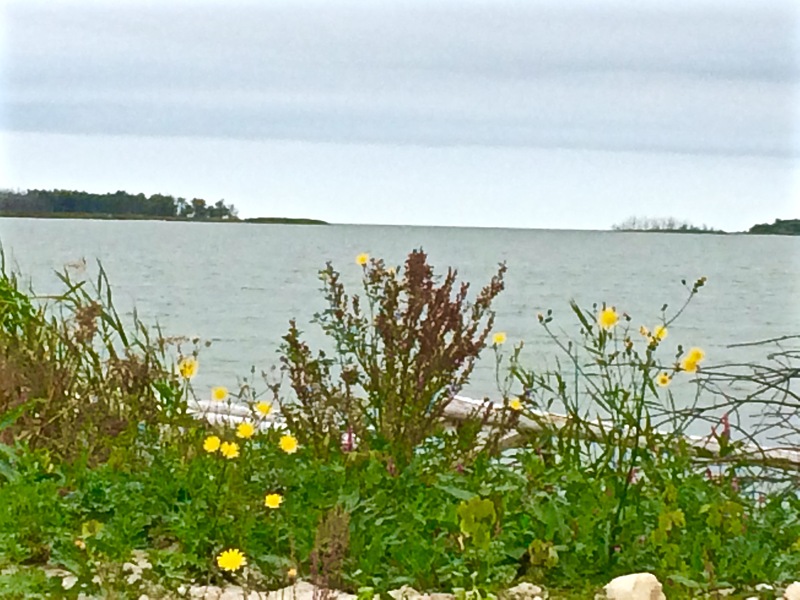 For a break from the road we stop in the town of Gimli on the western shore of Lake Winnipeg. 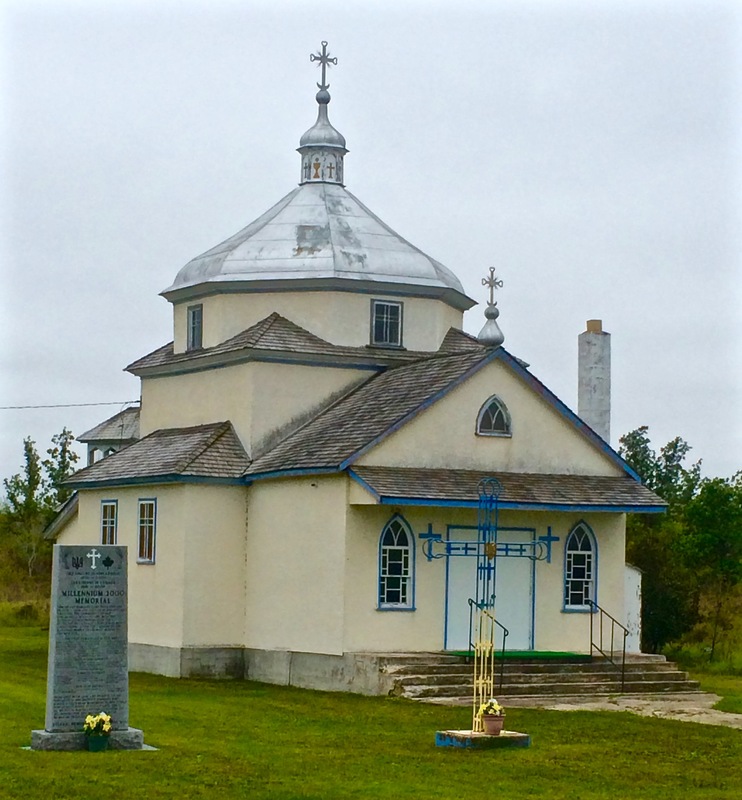 Gimli was settled by immigrants from Iceland and is said to be the largest Icelandic settlement outside of the North Atlantic island country. 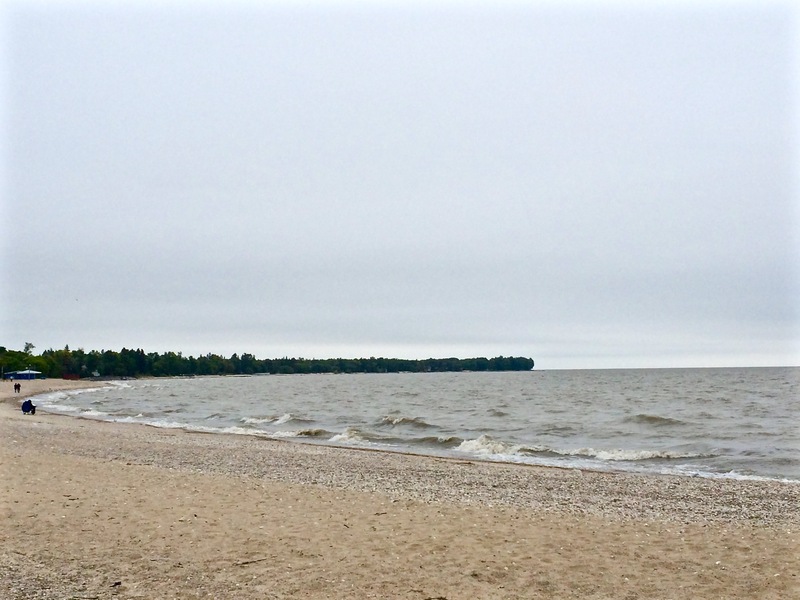 With waves stirred by a brisk wind and lake stretching to the horizon we can almost imagine being oceanside. While exploring town we decide to have a late lunch at a waterfront restaurant, Seagulls. By the end of a delicious lunch and friendly, accommodating waitress we decide we like the little town of Gimli and book a room at the adjoining Lakeview Resort. The weather is warm enough to sit on the balcony, protected from the wind. A restful end to the day. Elkhart Resort borders Riding Mountain National Park near the village of Wasagaming and Clear Lake, the largest in the park. Accommodations include lodge rooms from a standard double to executive king and chalets with one to four bedrooms. On site facilities include a full-service spa and mineral pool, family-friendly indoor swimming pool with indoor and outdoor hot tubs, and golf course. A private horse facility is located on the grounds. Guests find over 400km of hiking and cross country ski trails at the resort plus all those in the National Park. Winter visitors can enjoy ice skating, tobogganing, dog sledding and snowmobiling. Or, a full day of pampering in the spa. Personal Note: Not knowing how much time we would spend in the park we arrive at Elkhart Resort without a reservation. No problem for a mid-September weeknight – we select a deluxe fireplace king room. The comfortable spacious room include a sectional sofa with chaise lounge, fireplace and private patio with all the expected amenities. We have drinks and dinner in the Buffalo Bar overlooking the golf course. I recommend the stuffed Yorkshire pudding.